Like most people I guess, I started with 00, which gradually developed from being pinned to a piece of chipboard to running around the rafters of my parent's loft. It helped that my Dad was enthusiastic enough to floor the loft, build baseboards around it, and generally funding things! A feature of our family life was the regular trips to the Library, however unlike the rest of the family I have never been into reading fiction in a big way. So I migrated from the kids section to the transport section, and started reading about model and real railways. That inspired me to build more realistic model railways, but also books such as JIC Boyd's Talyllyn Railway, and P.D.Hancock's Narrow Gauge Adventure had started the narrow-gauge bug! I saw 009 as a great way to build a realistic and interesting model railway in my bedroom, having already discovered that an unconverted loft is a hot/cold/dusty/uncomfortable place to be (by this time I was taller than the rafters! ), so I came up with a plan for a layout to fit the desk under my "Captain Bunk" bed, just 3'6" by 2'6". I fitted a lot in; an oval of track with a station, goods sidings, and a branch that climbed from the station to a quarry at the back. 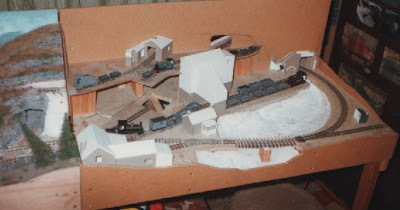 I also got a lot wrong - the curves were too tight, gradients too steep, tracklaying very dodgy, the rear of the loop was inaccessable in a tunnel, I even made the baseboard out of hardboard which meant it weighed a ton and was not that strong! However I learned a lot, I was quite proud of the scenary, I even "exhibited" it at a local church open day! I also managed to sell it, so not bad for a first attempt. 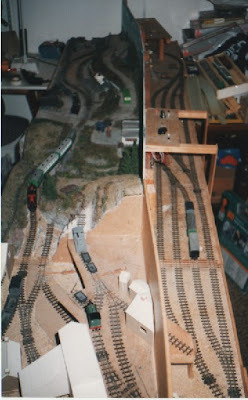 A poor quality scanned picture of my second layout, Pen-Y-Bryn. For some reason the church roof never got painted, and the station never got a roof at all! This was followed by another 009 layout with a similar (Welsh) theme, but incorporating a lot of lessons learned from the first. It was 6' long by 2' wide in two 3' long boards built from ply and softwood with a chipboard top, and had their own slot in legs. There was a station at the front, with a line passing over a stream into a tunnel returning to the rear sidings in an oval layout. I still made mistakes, cramming too much track into the station area, and a piece of curved track running into a point took a lot of work to get it reasonable! But again I was happy with the scenics (although never completely finished), the baseboards and electrics (my first venture with point motors) worked well, and I was getting better at making loco's and stock run properly too. This layout even got a name, "Pen-Y-Bryn". My next layout was a return to 00 gauge, and probably my first true "micro" layout, although that term wasn't used then! It was just 3' 6" by 1' scenic area with a 2' long cassette fiddle-yard (remarkably similar to Awngate come to think of it!) and represented a diesel depot, or MPD. It was "modern image" at the time, which meant the colourful liveries of sectorisation, and as well as a low-relief shed and a refuelling depot it featured an fuel store for shunting tank wagons, and a civil engineers siding. The plan actually featured as a Plan Of The Month in Railway Modeller magazine. Fun though that layout was, the charm of narrow gauge continued to appeal. So I built an extension to Pen-Y-Bryn featuring a quarry, as well as an extended run around a lake. Sadly although the track was laid, and the buildings made, I never completed the extension before I left home. I had come up with a good means of controlling a bank of hidden sidings with two controllers, featuring route-selection from rotary switches and a diode-matrix, which I was rather proud of. I was also proud of the buildings from the extension too, which rather showed how my skills had improved since I built the original part of the layout, fortunately they later found homes on Southon Yard and Pen-Y-Bryn Quarry (which also inherited the name!). The extension to Pen-Y-Bryn, recognise those unfinished buildings? As a child my family used to take long holidays in our caravan, and since even then I used to enjoy designing layouts, I doodled plans for a layout that would fit into a locker! However when I left home for university I figured I needed a layout to take, so out came the plan. The track layout was inspired by a layout called "Minibury Abbas" which I saw at a show, it used just 3 points and for a train to reverse a second loco was required to shunt it. Unlikely perhaps, but more interesting to operate! Boxton with later addition of fiddle-yard and lighting. So Boxton was a true micro-layout, two boards of 15" by 6" which bolted together when one was inverted to make a box for transport. Although it incorporated a hidden track it wasn't very practical for rearranging a train, so later I added an external fiddle yard, and at the same time a top for the layout incorporating lighting, making it into a shelf display layout - a concept I have used on all subsequent layouts. The track plan was so compact I used Peco N-gauge set-track points to save space, although as they had dead frogs it did lead to poor running. They were operated via stiff wire (paper-clips - I was a student! ), which terminated disguised as stacks of boxes, sacks, or barrels, pushing or pulling them changed the point! There followed another abortive project to build a light-railway terminus in 00 with a narrow-gauge (009) feeder. The concept was set high in a Welsh valley, the narrow gauge was to serve a dam construction project. However although at 7' long it was hardly a large layout, after several flat/house moves and about 7 years progress had stalled, and the arrival of children finally evicted it from the house altogether. By that time I had returned to the micro-layout theme with Southon Yard and Pen-Y-Bryn Quarry.